This study, which builds on high-precision unspiked Cassignol-Gillot K-Ar age determinations, presents an advanced DEM-based volumetrical analysis to infer long-term magma output rates for the Late Quaternary Ciomadul (Csomád) dacitic lava dome complex (East Carpathians, Romania). The volcanic field of Ciomadul developed on the erosional surface of Lower Cretaceous flysch and ~ 2 Ma old andesites and experienced an extended eruptive history from ~ 850 to < 30 ka. Predominantly effusive activity took place during the first stage (~ 850 to ~ 440 ka), producing volumetrically minor, isolated, peripheral domes. Subsequently, after a ~ 250 ky repose interval, a voluminous central dome cluster developed in the second stage (~ 200 to < 30 ka). During the youngest phase of evolution (~ 60 to < 30 ka), highly explosive eruptions also occurred, resulting in the formation of two craters (Mohos and St. Ana). The calculated ~ 8.00 ± 0.55 km3 total volume of the lava domes, which includes the related volcaniclastic (1.57 km3) as well as erosionally removed (0.18 km3) material, is in line with dimensions of other medium-sized dacitic lava domes worldwide. This volume was extruded at an average long-term magma output rate of 9.76 km3/My (0.0098 km3/ky). However, most of the domes (7.53 ± 0.51 km3) were formed in the 200 to < 30 ka period, implying a significantly increased magma output rate of 37.40 km3/My (0.0374 km3/ky), more than 30 times higher than in the first stage. Within these long-term trends, individual lava domes of Ciomadul (e.g. those with volumes between 0.02 and 0.40 km3) would have been emplaced at much higher rates over a period of years to tens of years. The active periods, lasting up to hundreds of years, would have been followed by repose periods ~ 30 times longer. The most recent eruption of Ciomadul has been dated here at 27.7 ± 1.4 ka. This age, which is in agreement with radiocarbon dates for the onset of lake sediment accumulation in St. Ana crater, dates fragmented lava blocks which are possibly related to a disrupted dome. This suggests that during the last, typically explosive, phase of Ciomadul, lava dome extrusion was still ongoing. In a global context, the analysis of the volumetric dynamism of Ciomadul’s activity gives insights into the temporal variations in magma output; at lava domes, short-term (day- or week-scale) eruption rates smooth out in long-term (millenia-scale) output rates which are tens of times lower. The online version of this article ( https://doi.org/10.1007/s00445-019-1287-8) contains supplementary material, which is available to authorized users. Lava domes, typically monogenetic landforms (Smith and Németh 2017) resulting from viscous lava extrusion (Davidson and de Silva 2000; Fink and Anderson 2017), occur in a wide range of geodynamic or volcanic settings. In most cases, they are part of composite volcanic edifices, often called lava dome complexes (Lockwood and Hazlett 2010), or belong to silicic caldera systems, where they form during less explosive volcanic periods (Wohletz and Heiken 1992). However, they can also occur as isolated volcanic features, ranging from lava dome fields to separate landforms, which are typical along the Inner Carpathian Volcanic Range (Lexa et al. 2010). The short-term temporal evolution of lava dome fields and relation with output rate is quite well constrained at individual dome systems (e.g. Riggs et al. 1997; Scott et al. 2008; Ryan et al. 2010; Fink and Anderson 2017). However, the long-term tempo of magma output is much less studied. Exceptions include examples from large, intra-plate volcanic fields such as the San Francisco Volcanic Field, which displays a number of volcano types: scoria cones, lava domes and a composite cone (Tanaka et al. 1986; Wood and Kienle 1990; Priest et al. 2001; Karátson et al. 2010a). This paper focuses on the volcanic arc-related Ciomadul (Csomád)1lava dome complex (Mason et al. 1998) that marks the southernmost terminus of the East Carpathian volcanic range in Romania (Fig. 1). Ciomadul, a long-lived volcano, developed over the past ~ 850 ky (Szakács et al. 2015; Molnár et al. 2018; Lahitte et al. this volume). Our main objective is to present the dynamism of the eruptive history over this period and to compare long-term magma output to short-term eruptive rates. 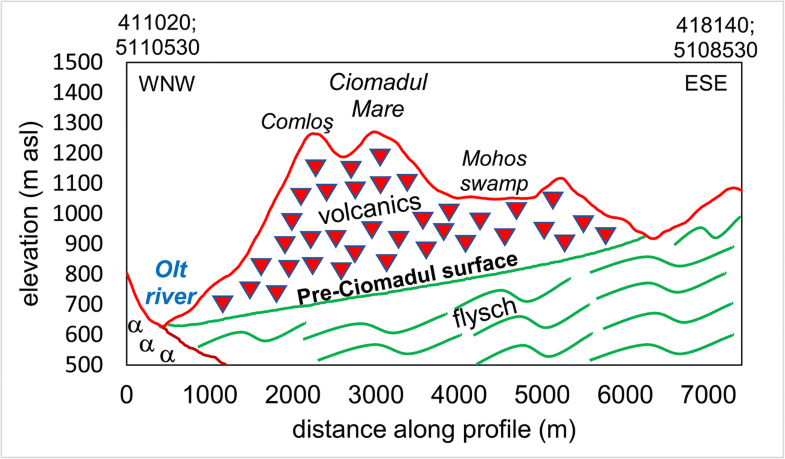 The volcanic evolution of Ciomadul has been intensely studied in the past decade (e.g. Karátson 2007; Vinkler et al. 2007; Harangi et al. 2010, 2015; Popa et al. 2012; Karátson et al. 2013, 2016; Kiss et al. 2014; Szakács et al. 2015). However, there are a number of issues related to the spatial and temporal evolution that have not yet been clarified. In particular, Ciomadul (Fig. 2), which consists of a central, superimposed dome complex and a few scattered peripheral domes (Szakács et al. 2015), evolved during two somewhat contrasting stages. In our paper, we demonstrate that, in terms of magma output, distinguishing between these stages is fundamental. The first stage, lasting from ~ 850 to ~ 440 ka (Molnár et al. 2018; Lahitte et al. this volume), was marked by typically low lava dome growth rates, characterised by mostly effusive activity (Szakács et al. 2015). The second stage, beginning at ~ 200 ka (Lahitte et al. this volume) and ending at less than 30 ka (Karátson et al. 2016; Wulf et al. 2016), was more explosive; in addition to occasional Vulcanian eruptions, both Plinian and phreatomagmatic eruptions occurred, especially during the final phase of activity (Szakács et al. 2015; Karátson et al. 2016, 2017; Wulf et al. 2016; Veres et al. 2018). This latest explosive phase resulted in the formation of the two prominent craters in the central part of the volcanic complex that truncate the main domes: Mohoş (Mohos), hosting a peat bog, and St. Ana (Szent Anna), hosting a lake (Fig. 2). To constrain the eruptive activity, in particular, magma output rates as well as the temporal and geomorphological relationships of subsequent domes, precise dating is fundamental. Whereas there is largely a consensus that the final explosive phase was confined to ~ > 50 to ~ 30 ka (Moriya et al. 1995, 1996; Harangi et al. 2015; Szakács et al. 2015; Karátson et al. 2016), the timing of the extended, preceding, period of lava dome growth has remained poorly constrained, although knowledge about the onset of volcanism has recently been improved by (U-Th)/He dating (Molnár et al. 2018). In the first part of this work (Lahitte et al. this volume), Cassignol-Gillot unspiked K-Ar dating (Gillot and Cornette 1986) has been applied to provide nine new high-precision K-Ar ages for selected samples, giving insight into the whole lifetime of Ciomadul. While Lahitte et al. 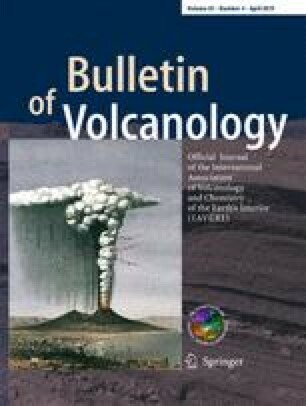 (this volume) focused on the implications for the evolution of the magmatic feeding system, we here consider the implications for the volumetric evolution of the dome complex, as discussed previously in Karátson et al. (2018a, b). Thus, in the second part of this work, we take the new ages obtained by Lahitte et al. (this volume), complemented by four further Cassignol-Gillot K/Ar age determinations, which clarify the age of the basal surface and the last activity of Ciomadul. These ages make it possible to analyse the volumetrical dynamism of the lava dome complex over the past 850 ky combining the age data with a digital elevation model (DEM)-based approach, and to infer the volcano-geomorphological evolution of Ciomadul through its whole lifetime. From a geodynamic point of view, the NNW-SSE trending East Carpathian volcanic range (Fig. 1) is related to a post-collisional setting (Mason et al. 1998; Seghedi et al. 1998, 2004; Chalot-Prat and Gîrbacea 2000). The volcanic activity developed subsequent to a W-directed, retreating subduction of a land-locked narrow oceanic basin between the Tisia block and the East European platform (Mason et al. 1998; Seghedi et al. 2004). Due to the migration of the magma-generating zone at mantle depths (Mason et al. 1998), a time-space migration of volcanic activity occurred over the past ~ 10 My (Pécskay et al. 1995, 2006; Szakács and Seghedi 1995). During the timespan of volcanism, magma output gradually decreased with time (Szakács et al. 1993; Karátson and Timár 2005; Szakács et al. 2015). 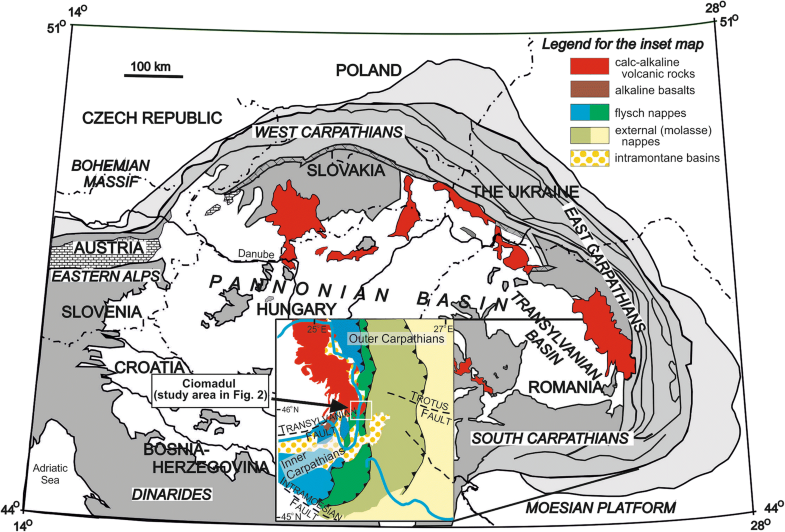 The chain terminus of the range crosscuts the fold-and-thrust orogenic belt of the East Carpathians in the Ciomadul region (Fig. 1; Szakács et al. 1993). At Ciomadul, the lava domes were emplaced mostly on Cretaceous flysch (a sandstone-shale band forming the outer Carpathians: Săndulescu 1988) and, at their western side in the Tuşnad (Tusnád) Gorge, on Early Pleistocene andesites and dacites of the adjacent Pilişca (Piliske) volcano (Szakács et al. 2015). In some places, Ciomadul pyroclastic rocks overlie a palaeosol that developed on top of fluvial terrace gravels (Szakács et al. 2015). Direct contacts of Ciomadul dacite lavas or pyroclastics with underlying andesites belonging to Pilişca volcanic edifice, exposed along the Olt riverbed, also occur (Fig. 2). The prevailing rock type of Ciomadul is porphyritic dacite (SiO2 = 63–68 wt%; K2O = 3.0–3.5 wt%: Szakács and Seghedi 1986; Kiss et al. 2014; Lahitte et al. this volume), with a mineral assemblage of plagioclase, amphibole, biotite, occasional clinopyroxene, orthopyroxene, quartz, K-feldspar, olivine, and minor apatite, titanite, zircon and allanite (Jánosi 1983; Szakács and Seghedi 1986; Mason et al. 1998; Kiss et al. 2014; Harangi et al. 2015). The petrogenetic evolution of the volcanism at the chain terminus has been discussed by Seghedi et al. (1987), Szakács et al. (1993), Mason et al. (1998), Vinkler et al. (2007), Kiss et al. (2014) and Lahitte et al. (this volume). Geographically, the Ciomadul lava dome complex is separated from the main andesitic volcanic range (the Călimani[Kelemen]–Gurghiu[Görgényi]–Harghita[Hargita] Mountains) by the river Olt along the deeply cut Tuşnad Gorge (Fig. 2). The chain terminus east of the gorge is called the “Ciomadul-Puturosu” (Csomád-Büdös) Hills in the geographical literature (Bányai 1964) and has developed over an area of ca. 75 km2. The central, much larger and younger volcanic dome area with some peripheral domes (Fig. 2) is separated toward the southeast and east by the uplifted Cretaceous flysch zone, which is cut by the older Dealul Mare (Hegyes-tető) dome and the volumetrically insignificant, isolated and older dome remnants (partly volcanic necks) of Puturosu (Büdös) and Balvanyos (Bálványos). The whole Ciomadul-Puturosu area was mapped by Szakács and Seghedi (1990), with the resultant map also published in simplified form by Szakács et al. (2015). To the southeast of the Ciomadul-Puturosu dacitic dome cluster, the isolated dome of Dealul Mare was also considered to belong to the older Ciomadul domes by Szakács et al. (2015) who obtained a K-Ar age of 1.02 ± 0.07 (all age dates are reported with 1σ uncertainty). Although Dealul Mare is andesitic in composition (Szakács and Seghedi 1986), there are five features which suggest that the dome is part of the Ciomadul dome complex: (1) its position is close to the central dome cluster (closer than some of the peripheral dacitic domes such as Haramul Mic in the N, and Puturosul and Balvanyos in the E); (2) its morphology and size are similar to the main dacitic domes; (3) its phenocryst content (plagioclase, amphibole, biotite) is identical to that of the dacitic Ciomadul domes (with a slightly more mafic groundmass composition: Szakács and Seghedi 1986; Szakács et al. 2015); (4) according to the major element geochemistry of the andesite, it belongs to the same cluster of data points in the petrochemical diagrams (except the lower silica content) as the rest of the Ciomadul dome rocks (Szakács and Seghedi 1986); (5) there are mafic components in parts of the dacite dome rocks, such as pyroxene (Szakács and Seghedi 1986; Kiss et al. 2014) or even olivine (Kiss et al. 2014). A newly obtained (U-Th)/He zircon age of 842 ± 53 ka (Molnár et al. 2018) overlaps with the K-Ar age of 1.02 ± 0.07 Ma (i.e. 1020 ± 70 ka; Szakács et al. 2015) at 2σ level and confirms that Dealul Mare is one of the oldest domes of the whole Ciomadul-Puturosu area. On this basis, we use a minimum age of ~ 850 ka for the onset of the Ciomadul volcanism. The larger area of the chain terminus of the volcanic range (Fig. 2) is characterised by much older and extended volcanism, for which conventional K-Ar and (U-Th)/He ages are available. Dating of the adjacent Pilişca volcanic edifice in the NW has typically yielded older ages than Ciomadul, between 2.6–1.5 Ma (Pécskay et al. 1995; Szakács et al. 2015; Molnár et al. 2018). One of its probably youngest satellite domes, Dealul Babei (Bába Laposa), is dacitic in composition, and has been dated at 1.46 ± 0.27 Ma (Szakács et al. 2015) and 942 ± 65 ka (Molnár et al. 2018), close to the earliest constrained Ciomadul activity. At the southernmost part of the volcanic range and to the west of river Olt, the two individual domes of Murgul Mare (Nagy Murgó: andesite) and Murgul Mic (Kis-Murgó: shoshonite), as well as the nearby Luget-Malnaş (Lüget-Málnás) shoshonite lava flows (Fig. 2), seem contemporaneous with the older part of Pilişca volcano. Murgul Mare was dated at 2.69 ± 0.22 Ma and 2.25 ± 0.09 Ma by Szakács et al. (2015), and at 1.86 ± 0.08 Ma by Molnár et al. (2018), whereas the Malnaş lava was dated at 2.22 ± 0.14 Ma by Peltz et al. (1987). Given the older ages and the predominantly different petrography compared with the Ciomadul dacites, the lava domes and flows of the southernmost part suggest a separate evolution and, as such, cannot be considered belonging to the Ciomadul volcanic system. Therefore, Murgul Mare (andesite) and Murgul Mic (shoshonite), along with the shoshonitic lava flows of Luget-Malnaş, are not included in our study. The basement of the western part of the Ciomadul dacites reveals older andesites of the Pilişca volcano which crop out along the Olt riverbed in the Tuşnad Gorge. A drillcore down to 109 m in the andesite yielded a K-Ar age of 1.93 ± 0.09 Ma (Szakács et al. 2015). To verify the age of the basement on which the Ciomadul dacites were emplaced, we performed further two Cassignol-Gillot K/Ar age determinations on the exposed andesites. For the Ciomadul-Puturosu dacitic lava dome evolution, the rocks of the southeastern Puturosu dome are somewhat younger than Dealul Mare; they have been dated at ~ 700 ka by both the conventional (Szakács et al. 2015) and the Cassignol-Gillot K-Ar technique (Lahitte et al. this volume). A slightly younger age of 641 ± 9 ka has been obtained on the neighbouring Balvanyos dome (Lahitte et al. this volume), whereas another, much younger age of 440 ± 12 ka probably dates an adjacent dome (locality uncertain). In contrast to the younger, central domes, it is this relatively old Puturosu (meaning “stinky”) area that shows the most intense H2S-bearing CO2 gas emissions at present (Szakács 2010; Kis et al. 2017). Haramul Mic (Kis-Haram), which faces the wide alluvial plain of the Ciuc (Csíki) Basin, is the northernmost of the Ciomadul lava domes (Fig. 2). This flat-topped dome was considered previously as one of the oldest, eroded features of the whole lava dome complex and was dated at 0.85 Ma, i.e. similar to Dealul Mare (Pécskay et al. 1995; Szakács et al. 2015). However, it was also proposed that it is just a “low dome” in the sense of Blake (1989), being roughly contemporaneous with the main, central dome group (Karátson et al. 2013). Both the newly obtained 163 ± 11 ka (U-Th)/He age (Molnár et al. 2018) and the 245 ± 22 ka Cassignol-Gillot K-Ar age (Lahitte et al. 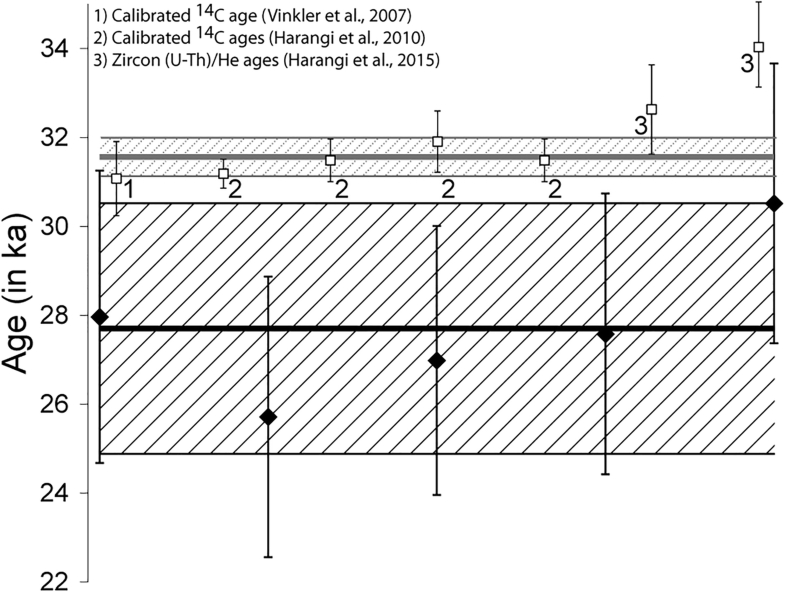 this volume) confirm that Haramul Mic is indeed significantly younger than the 700–800 ka old southern lava domes (Molnár et al. 2018; Lahitte et al. this volume). Based on the new Cassignol-Gillot K/Ar groundmass age determinations, the emplacement of the Haramul Mic dome was followed by the satellite dome Vf. Cetăţii (Vár-tető) at 184 ± 5 ka and, subsequently, the main central dome complex consisting of the roughly coeval Vf. Comloş (Komlós-tető) and Ciomadul Mare (Nagy-Csomád) domes dated at 144 ± 4 ka and 133 ± 18 ka, respectively (Lahitte et al. this volume). After a possible short repose period, the eruptive activity at Ciomadul was followed by construction of the highly symmetrical dome of Haramul Mare (Nagy-Haram) at 96 ± 2 ka (Lahitte et al. this volume). The Ciomadul Mare domes (along with Vf. Comloş, and the not yet dated Vf. Surduc [Szurdok-tető] dome) represent the largest part of the central dome complex by volume. Finally, the twin-crater morphology of Mohoş and St. Ana was created during the latest explosive phase of the second stage (Szakács et al. 1993; Szakács and Seghedi 1995; Karátson et al. 2013, 2016; Szakács et al. 2015). Karátson et al. (2013) proposed that the flat, uniform, arcuate northern lava dome rim of Ciomadul Mare (with its highest point at 1301 m a.s.l.) may be linked to a large pre-Mohoş crater-forming eruption. This may have been followed by the formation of the Mohoş crater, associated with one of the so-called “Turia phreatomagmatic eruptions” (Karátson et al. 2016) dated at ≥ 50 ka. The Mohoş crater hosts a ~ 60 m-thick lacustrine/peat succession with a number of tephra units (Karátson et al. 2016; Wulf et al. 2016), the oldest of which are not yet dated. Dating of a crater rim dome or flow on the southern slopes, Piscul Pietros (Köves Ponk, Fig. 2), which is truncated by the crater morphology, yielded a K-Ar age of 60 ± 5 ka (Lahitte et al. this volume), in contrast to earlier published K-Ar ages of around 0.5 Ma (Pécskay et al. 1995; Szakács et al. 2015). Such a morphological relationship places the final explosive phase at younger than 60 ka. In this paper, to confirm the age relationship of the Mohoş crater and its surrounding lava domes, new K-Ar dating was conducted on another rim dome in the north, Vf. Mohoş (Mohos-tető). The final eruptions of Ciomadul originated from the circular-shaped St. Ana explosion crater that cuts the Mohoş crater rim. Two subsequent explosive eruptions labelled as “TGS” (a plinian or subplinian eruption sequence named after the town of Târgu Secuiesc) and “LSPA” (Latest St. Ana phreatomagmatic activity) may have been related to the final crater formation (Karátson et al. 2016, 2017; Wulf et al. 2016). Of these, LSPA might have occurred at ~ 29 ka on the basis of 14C ages obtained from both the lower part of the sediment infill of St. Ana crater lake (Magyari et al. 2014) and the upper part of the Mohoş lacustrine succession (Karátson et al. 2016; Wulf et al. 2016). The present-day St. Ana crater rim reveals fragmented but massive fresh lava dome blocks, which occur in particular on the southern crater slopes and are presumably of LSPA age. Apart from the 60 ± 5 ka Piscul Pietros lava dome (or coulée), there is no other original dome landform nearby with which these blocks can be correlated. Therefore, the exposed rocks might correspond to an explosively disrupted dome in the vicinity, possibly related to St. Ana crater. Cassignol-Gillot K-Ar dating was applied on one of the scattered blocks to constrain this terminal volcanic activity. The lava domes of Ciomadul are in some cases surrounded by the original breccia apron (Szakács et al. (2015). The apron includes some dacite lava flows (up to 5–6-km long) sourced from the domes (Szakács et al. 2015). However, the majority of the apron also includes finer grained volcaniclastic deposits, including outwash sheets, debris-flow deposits, and minor block-and-ash flow deposits (cf. Santiaguíto: Rose 1987). A part of these accumulated during the eruptive stages, but significant reworking might have contributed to the aprons post-eruptively, during the Last Glacial Maximum, when the vegetation at Ciomadul was sparse and erosion intensified (Magyari et al. 2014). Erosion certainly reduced the volume of the original domes to some extent, but the eroded material may have largely been added to the apron volume (cf. Kuenzi et al. 1979). More distal volcaniclastic deposits, which are poorly constrained, also occur in the Ciuc Basin to the north of Ciomadul, as well as along the margins of the southern-lying Bodoc (Bodok) and Turia (Torjai) Mountains. However, as Szakács et al. (2015) stated, overall the lava dome shapes show only insignificant post-eruptive erosional overprint. It should also be noted that the margins of the domes as well as the topographic lows in between the domes (in particular on the eastern and southern flanks of the edifice) are in some places covered or draped by the pyroclastic deposits of the latest explosive phase (Szakács et al. 2015, Karátson et al. 2016). The volume of the pyroclastic deposits has not yet been assessed, but their contribution to Ciomadul is negligible. Volumetrical time inventories of volcanic edifices can be determined at different spatial and temporal scales ranging from regional tectonic/erosional studies (e.g. Stoiber and Carr 1973; White et al. 2006; Karátson et al. 2012) to those considering fast and occasionally m-scale topographic changes occurring at active volcanoes (e.g. Fornaciai et al. 2012; Favalli et al. 2010; Diefenbach et al. 2013). Previously, volumetrical (and other morphometrical) studies simply used topographic map data (Pike and Clow 1981), but since the advent of digital elevation models (DEM) with worldwide (SRTM, ASTER) or regional (e.g. US NED, TINITALY) coverage, the procedure of landform delimitation or volume calculation has become more accurate. A number of recent volumetrical studies have resulted including those covering small monogenetic landforms such as scoria cones (e.g. Favalli et al. 2009; Bemis et al. 2011; Kereszturi and Németh 2012; Kervyn et al. 2012; Bemis and Ferencz 2017) and lava domes (Lahitte et al. 2012; Karátson et al. 2013; Nomikou et al. 2014), as well as large polygenetic landforms such as composite (e.g. Grosse et al. 2009; Karátson et al. 2010b; Lavigne et al. 2013; Germa et al. 2015; Ricci et al. 2015) and shield volcanoes (e.g. Germa et al. 2010; Salvany et al. 2012; Pedersen and Grosse 2014; Grosse and Kervyn 2018). However, relatively few papers discuss the possible error factors of volume calculations. Examples include Bohnenstiehl et al. (2012) who presented how the cone volume calculated by the closed-contouring algorithm changes with respect to the regional slope value and the contour search intervals. These authors found that the volume of low (~ 100-m high) cones might be underestimated by 30–50% if the basal surface is sloping (2°) or the contour interval is relatively large (20 m), and suggested a modified algorithm that takes into account the local slope when the edifice is outlined. Kereszturi and Procter (2016) showed how the calculated eruptive volumes of monogenetic volcanoes are sensitive to the input data type and their spatial resolution. As discussed in detail for small landforms by Favalli et al. (2009) and Kereszturi et al. (2013), and for larger edifices by Grosse et al. (2012), the precision of volume calculation largely depends on the appropriate delimitation of volcano boundaries and the related basal surface. Defining the boundary of any volcano might be complicated by the diverse, often compound architecture of the volcanic terrain (e.g. disturbed boundaries with adjacent, sometimes superimposed volcanoes and/or surrounding landscape, far-reaching volcanic products, such as long lava flows, and tilted basal surfaces). However, constructional landforms (e.g. composite and shield volcanoes, as well as individual domes and cones), which have a positive topography, are commonly bounded by concave breaks in slope, a feature which is used to define the boundaries in most DEM-based studies (Karátson and Timár 2005; Favalli et al. 2009; Grosse et al. 2012; Karátson et al. 2012). In particular, Grosse et al. (2009) and Euillades et al. (2013) derived automated methods for a more objective boundary definition. As a result of such advances, volume calculation is now a routine task if the required input parameters, such as appropriate data from regional geology, field mapping, and DEM coverage, are available. DEM data provided by the SRTM data base with 3" (~90 m spatial resolution) was found sufficient for composite and shield volcanoes (e.g. Karátson and Timár 2005; Kervyn et al. 2008; Karátson et al. 2010b, 2012; Lavigne et al. 2013), whereas higher spatial resolution DEMs are required for studying smaller monogenetic landforms such as scoria cones (Fornaciai et al. 2012). Small surface changes on active volcanoes can be studied preferably by LiDAR or photogrammetry-based with a 2–5 m resolution (Fornaciai et al. 2010). The method of numerical integration (“rectangular rule” versus “trapezoidal rule” versus “Simpson’s rule”). The accuracy of the base level (Yanalak and Baykal 2003; Grosse et al. 2012). In regard to point (2), all three of these methods use cell-based right prisms to calculate the volume, but in the rectangular case the prism top is flat, in the trapezoidal case the prism top is oblique, and in the Simpson case, the prism top is a parabolic surface, which provides a better approximation of the real surface (Press et al. 1988). For point (4), determining the appropriate base level of a given volcano raises several problems, such as the need for information on bedrock, the presence of subvolcanic bodies above or below the basement contact, or the role of tectonic faults. In order to quantify the error magnitudes attributed to all of these factors, we carried out test volume calculations on some volcanic landforms including small (lava domes) and large (composite volcanoes) edifices, using data from Telbisz et al. (2017). We incrementally changed the spatial resolution, the outlined boundary and the base level of the target landforms, and used different methods of volume calculation to assess the effect of spatial resolution, the integration method, the horizontal delimitation and the base level, on the final result (see Table 4 in Appendix). Our comparison based on 1/9" (~ 3m), 1/3" (~ 10 m) LiDAR, 1" (~ 30m) and 3" (~ 90 m) SRTM data shows that in most cases the volumes can be appropriately calculated by using SRTM 1" or even SRTM 3". Namely, the average of volume differences between SRTM 1" and the best available spatial resolution dataset is only 2.8%. The integration method of volume calculation (rectangular versus trapezoidal; Simpson’s rule vs trapezoidal) yields a negligible difference, which is generally less than 1‰. On the other hand, delimitation of the horizontal boundaries has a more important effect on the volume; we found that 1% variation in the average edifice radius introduces an average error of 0.8% in terms of volume. In the case of field-based studies (i.e. when reliable geological maps are available), the error of the average edifice radius may be in the 1–5% range, thus the resultant error on volume is less than 4%. where cotangent function is the reciprocal of tangent (tg). This represents, for instance, a relative error of 10% for a difference of 10 m at the base level of a 300-m-high volcano. Based on calculations of worldwide volcanic edifices (Telbisz et al. 2017), the base level error is 1% of the height, and the inferred volumetrical error is, on average, 6.1%. Admittedly, the base level uncertainty may exceed 1%, if the basement is not constrained by field evidence. Therefore, field constraints on the base level have been considered a crucial issue in our study if we are to obtain precise volumes. At Ciomadul, the boundaries of the individual lava domes were determined using the geological maps of Szakács and Seghedi (1990, 1995), Szakács et al. (2015), and the volcano-geomorphological map of Karátson et al. (2013). Dome boundaries were field-checked in spring 2017, adding GPS-fixed points of those surface outcrops where the boundary could be observed. Observations included lava flow and talus breccia outcrops in heavily vegetated surfaces, contacts between Ciomadul dome breccias and underlying Pilişca andesites, or flysch exposures. The modified extent of the lava domes and flows are depicted on an updated volcano-geomorphological map of Ciomadul (as given in Fig. 2). The northern apron northwest of Haramul Mic in particular suggests that lava flows reached the Olt river valley at the village of Tusnad Nou (Újtusnád). Although the precise areal extent is impossible to outline, the northernmost lava outcrop cut by the river can be connected southward to local hummocks (locally called “ponks”), which are interpreted here as isolated, eroded original lava surfaces (further sculpted by long-term agricultural activity). Based on their position, a lava flow direction from the south can be assumed, i.e. from Haramul Mare or perhaps Haramul Mic (Fig. 2). In addition, according to our field inspection, both Haramul Mare and, especially, Haramul Mic have larger, extended talus breccia aprons, in some places covering the proximal lava flows. To the west, the Ciomadul dacites directly overlie older andesites of the adjacent Pilișca (Piliske) volcano in the South Harghita Mountains (Szakács et al. 2015). These andesites crop out at numerous sites between 610 and 650 m elevation along the Olt riverbed which is deeply incised in the Tuşnad gorge. The obtained elevations were taken here as defining the basal surface for the dacitic volcanism of Ciomadul. In the east, the boundary of the uplifted Cretaceous flysch rocks, already indicated by Szakács and Seghedi (1990), has been confirmed by measuring outcrops with GPS in some deeply incised stream and road cuts. The flysch is exposed commonly at around 700–800 m a.s.l., but at the elevated Bolondos Hill, as high as at 980 m a.s.l. In the southeast, in contrast to the published volcanological map (Szakács and Seghedi 1990), the Piscul Pietros lavas flowed farther to the south, directly overlying both the flysch exposed along the stream of Paraul Jimbor (Zsombor stream) and the older andesites of Dealul Mare at ~ 780–790 m a.s.l. Taking all these additional data into consideration, the basal boundary polygon of Ciomadul has a lowermost point at 579 m, a highest point at 980 m and an average elevation of 704 m.
On the basis of the geological cross sections given in Szakács and Seghedi (1990), the interpolation between the underlying western (Pilişca) andesites and the eastern flysch defines a “pre-Ciomadul” surface, which slightly dips toward the present-day Olt river (Fig. 3). On the DEM, this surface was created by filling the outlined dome area by natural neighbour interpolation. The interpolated surface has an average elevation of 714 m a.s.l., very similar to the 704 m determined from the surface polygon boundary. The interpolated surface indicates a relatively wide valley or basin, which likely existed prior to the volcanic activity. This dipping surface was taken as the pre-Ciomadul basal surface instead of a flat, constant base level. Individual dome volumes (Table 1) were calculated using the superficial boundary of each dome extended by a gently dipping (< 5o), 100–500 m wide apron based on the volcanological map of Szakács and Seghedi (1990) and our own field observations. To calculate the gradual increase of erupted magma volumes during the evolution of the dome complex, we reconstructed DEMs of the successive dome-building stages. Starting from the basal surface, individual domes with their aprons were added to the DEM step by step, following an order defined by their respective ages. Erosional changes between subsequent domes were considered negligible in relation to their dominantly young, < 200 ka age and an overall 31.5 m/My denudation rate obtained for the larger area (Karátson 1996). Volumes of individual lava domes (or coalesced lava dome groups) were calculated from DEM differences between two subsequent stages. Thus, we did not use a constant base level but an updated topography in each step. The volume calculation method used was the trapezoidal rule. The temporal evolution, defined by the successive growth of individual lava domes, has been constrained using the new Cassignol-Gillot K-Ar dates (as is given in Table 1). The age of Vf. Surduc (Szurdok-tető), which was not determined, has been tentatively placed between Vf. Cetăţii and Vf. Comloş on the basis that its position is in between the latter two. Within Table 1, a number of domes (e.g. Ciomadul Mare, Haramul Mare) consist of extrusions from more than one vent (they thus represent compound domes such as Soufriére Hills, Montserrat: Hale and Wadge 2008); however, without detailed ages, their emplacement histories cannot be further subdivided. The resulting total volume of the entire Ciomadul edifice is 7.82 ± 0.41 km3 (Table 1). About 80% of this volume (6.25 km3) belongs to the lava domes themselves (note that all estimates here are bulk rock), whereas the remaining 20% (1.57 km3) includes the undifferentiated volcaniclastic material forming the surrounding aprons. Individual dome volumes, in the case of the simple landforms which could have been determined, are on the order of 0.1–0.4 km3, i.e. ~ 3–6% of the whole lava dome complex. Some minor domes (e.g. Balvanyos, Mohoş) have even smaller volumes (0.02–0.1 km3). The two largest coalesced lava domes (Ciomadul Mare and Haramul Mare) have a volume of 4.1 km3 (~ 53% of the whole complex). Erosion has affected the original erupted volumes. We have already noted that the talus breccias are mostly related to synvolcanic redeposition, likely enhanced by post-eruptive erosion. In contrast, at present, debris-flow activity or significant slope wash processes are not observed; a result from thick vegetation cover. In accordance with this, fluvial dissection of the area is also minor due to the young age of volcanism as well as the protective soil and vegetation cover. Field observations confirm that individual or coalesced domes tend to preserve their original shape. The erosionally removed material has fed the weakly evolved drainage network, which transports sediments to the neighbouring basins and the Olt river system (Bányai 1917, 1964; Bulla 1948; Fielitz and Seghedi 2005). By aggregating periods with low versus high erosion, the volume of the material removed by erosion during the whole life time of Ciomadul can be estimated using the area-specific long-term erosion rate (surface lowering) estimate of 31.5 m/My, which was proposed for the study area using comparative morphometry (Karátson 1996). This rate is an average figure over the Northeast and East Carpathians, integrating a ca. 10 My period with multiple climatic changes. Numerically, this rate is in agreement with values derived by various methods for temperate continental climates (Saunders and Young 1983; Summerfield 1991). We calculated eroded volumes separately for each dome by using the average 31.5 m/My erosion rate, and the area and age of each dome (Table 1). Obviously, the error of the eroded volume is larger for the younger domes due to the fact that the applied erosion rate is long term; however, the magnitude of the overall erosion volume is reliable. The individual eroded volumes give a combined total of 0.18 km3 erosion for the whole Ciomadul-Puturosu Hills over the past ~ 850 ky. Adding this figure to the present-day volumes, the total original volume of the lava dome complex is proposed to have been 8.00 ± 0.55 km3. This means that the erosionally removed volume has been insignificant equating only to 2.2% of the total dome volume. Obviously, such a calculated erosion figure is considered a minimum estimate. On one hand, short-term post-eruptive erosion rates, due, for instance, to unvegetated surfaces, are generally higher than long-term rates (cf. Santiaguíto: Harris et al. 2006). As at Santiaguíto, the presence of areally significant volcaniclastic deposits may have also enhanced erosive processes in some proximal places. Nevertheless, given the little proportion of the eroded volume calculated, these uncertainties make no difference relative to the main results obtained on the volumetry of the volcanic activity. To constrain the time interval during which Ciomadul’s volcanism developed, the minimum age of the basement on which Ciomadul dacites were emplaced, and the age of the volcano’s latest activity, need to be known. Four selected lava samples, the localities of which are described above, were dated using the Cassignol-Gillot K-Ar technique in the Laboratoire GEOPS at Paris-Sud University, Orsay, France (Table 2). Full details of the analytical procedure are given in the accompanying study (Lahitte et al. this volume) as well as in the Supplement. The obtained ages presented here complement the nine new ages included in Lahitte et al. (this volume) and serve as the basis for magma output rate calculations. Located along the riverbed of the Olt in the southern part of Tuşnad Gorge, two samples from andesitic lava flows (17EC12 and 17EC13), attributed to Pilișca volcano and directly overlain by Ciomadul’s dacite lava, were dated at 2130 ± 30 ka and 2110 ± 30 ka, respectively. Such ages, within 2σ error, match the 1.93 ± 0.09 Ma conventional K-Ar age (Szakács et al. 2015) obtained on drillcore samples in the same area. The confirmed old age implies that the topographic level on which Ciomadul was emplaced can be considered palaeogeographically as an erosional surface, formed during the ca. 1 My-long time gap preceding Ciomadul’s activity. The sample of the lava dome of Vf. Mohoş (16CIO05) yielded a well-constrained age of 63.9 ± 1.6 ka (Table 2). This age, within 2σ uncertainty, is the same as that of the Piscul Pietros dome or flow (60 ± 5 ka). One of the scattered dacite lava blocks (sample 16CIO11), draping the southern slope of St. Ana crater, yielded an age of 27.7 ± 1.4 ka. In order to precisely constrain this latest activity, we performed five measurements of different aliquots of the same sample (Table 2). As described above, the exposed blocks may correspond to an extrusive phase, which is correlated, by their position, to one of the final Ciomadul eruptions, possibly the one that excavated the present-day St. Ana crater. The K-Ar age obtained is the youngest measured by direct dating of Ciomadul rocks and, compared with other dating results (e.g. Harangi et al. 2015; Szakács et al. 2015; Karátson et al. 2016), confirms that it can be taken as evidence of the latest activity of the volcanic edifice. Andesitic-dacitic lava domes vary highly in volume from ≤ 0.01 to ~ 30 km3. In Table 3, examples of some of the best-known andesitic-dacitic domes are given. Probably the largest dome, the Late Pleistocene Chao dacitic coulée (Chile), which is related to the Cerro del León stratovolcano (de Silva et al. 1994), has a volume of 26 km3, comparable with medium-sized stratovolcanoes. It was emplaced over an area of > 50 km2. 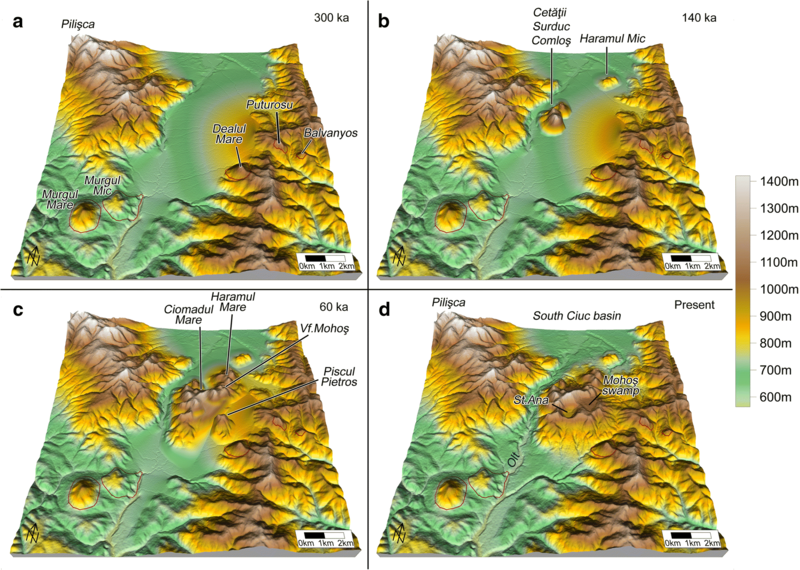 The post-caldera activity at Yellowstone caldera produced even larger-volume individual silicic lava units, such as the 72 ka rhyolitic Pitchstone Plateau of 70 km3 (Christiansen et al. 2007), but these are flows rather than domes. However, rhyolitic domes can also be exceptionally large, such as the 7.3 ka submarine dome at Kikai caldera, Japan, which has a volume of 32 km3 (Tatsumi et al. 2018). Another large dacitic dome, the Nevado del Toluca summit dome complex (Mexico), which formed within the past 50 ky, has a volume of 11 km3 (Capra et al. 2015). Examples of medium-sized lava domes include Santiaguíto (Guatemala), where four adjacent domes and flows have been extruded since 1922 (Harris et al. 2003), or the 1951 lava dome of Mt. Lamington in Papua New Guinea (Taylor 1958), both with ca. 1 km3 total volume. 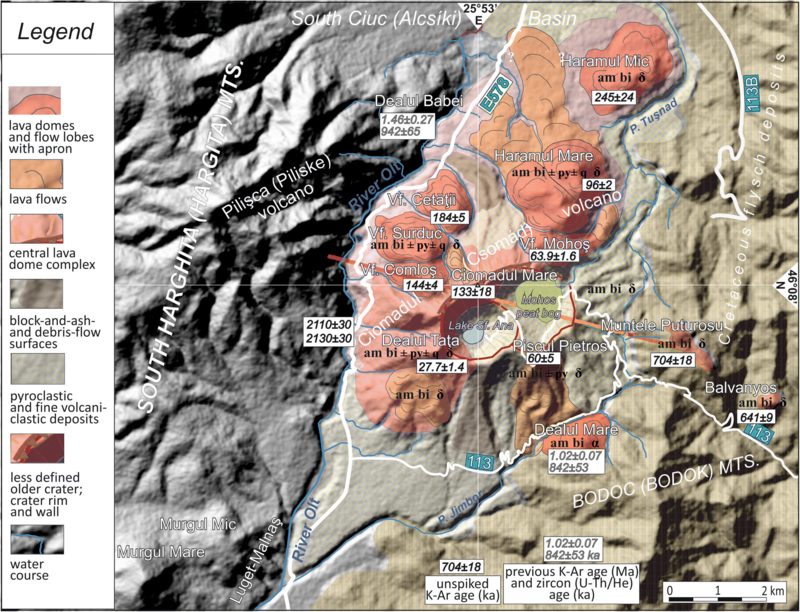 Similarly, the eruption of the Soufriére Hills dome complex (Montserrat) resulted in a total volume of 1 km3 between 1995 and 2009, the dome being constructed in four phases with lobes of 0.1–0.3 km3 in volume (Wadge et al. 2010; Ryan et al. 2010). At Unzen volcano, Japan, during the 1991–1993 eruption, a total dome volume of 0.2 km3 was extruded (Nakada et al. 1999). On the other hand, individual dome-forming events often produce much smaller, overlapping domes or flows, such as the andesitic dome of M. Pelée, Martinique (1902) with a summit plug of 0.01 km3 (Boudon et al. 2015), or the dacitic intracaldera dome of Mt. St. Helens (1980) also with a volume of 0.01 km3 (Scott et al. 2008). During one of the current dome-forming episodes (2006) of the basaltic andesite dome complex of Merapi, consisting of dome growth and collapse events (Charbonnier and Gertisser 2008), a total extruded magma volume of ~ 0.01 km3 was estimated (Carr et al. 2016). The 1912 eruption of Novarupta produced a small dome only 0.005 km3 in volume (Hildreth 1983; Yokoyama 2005). According to our volumetrical results, Ciomadul, with its reconstructed total volume of ~ 8 km3 spread over an area of ~ 75 km2, belongs to the medium-sized lava dome complexes. However, the dimensions of most individual Ciomadul domes, where morphology allows distinct dome shape determination, are in the range of 0.1–0.4 km3, similar to those at Santiaguíto, Mt. Lamington and Soufrière Hills. Such a finding makes it likely that those parts of the edifice where individual domes cannot be distinguished also grew by superimposed or amalgamated domes (apart from the scattered peripheral domes of Ciomadul in the NW, N and SE). When calculating the original dome volumes, it is important to assess how much material has been removed by erosion (e.g. Karátson 1996; Bemis et al. 2011). In a previous attempt at Ciomadul, Karátson and Timár (2005) considered the volcano volumes along the whole East Carpathians. They included Murgul Mare and Murgul Mic in the Ciomadul-Puturosu area (which, as we stated above, do not belong to Ciomadul), and calculated a total volume of 15.3 km3, including erosional removal of 3.1 km3. If we extract the volume of Murgul Mare and Murgul Mic and their aprons (ca. 2 km3) as well as the 3.1 km3 of eroded material, the result is 10 km3, roughly comparable with the 7.82 km3 obtained in this study. However, Karátson and Timár (2005) overestimated the eroded volume (3.1 km3 versus 0.18 km3 obtained here). This is because the approach of Karátson and Timár (2005) for calculating erosionally removed volumes was to “fill” valleys by surface envelopes using representative cross sections of the individual volcanic edifices. Whereas this method is correct for large, deeply dissected edifices and provides reliable results for other parts of the East Carpathians, it exaggerates the erosion rate for Ciomadul which shows only minor or no fluvial dissection. Erosion in the Ciomadul-Puturosu area was relatively significant only for the oldest southeastern domes (Dealul Mare, Puturosu and Balvanyos). At Puturosu, even the vent part of the dome is partly exposed, related likely to the significant uplift of the Cretaceous flysch and associated accelerated erosion. By contrast, the even older Dealul Mare dome, due probably to its lower position, still preserves a regular dome shape showing apparently little erosion. Szakács et al. (2015) presented a total volume of 8.74 km3 for Ciomadul (including the southern peripheral domes but without erosionally removed material), which is very similar to our calculations. However, in some cases, their individual dome volumes (see Table 4 in Szakács et al. 2015) are significantly larger than our estimates as listed in Table 1. For example, for Dealul Mare, Szakács et al. (2015) estimate 0.57 versus 0.30 km3 of this work; for Haramul Mic, the difference is 0.34 versus 0.19 km3; and for Puturosu, 0.17 versus 0.07 km3. On the basis of the volumetrical results (Table 1) and the new geochronological data (Tables 1, 2), time-averaged magma output rates of Ciomadul can be calculated. Certainly, obtaining such rates depends on the number of available radiometric ages and their resolution. 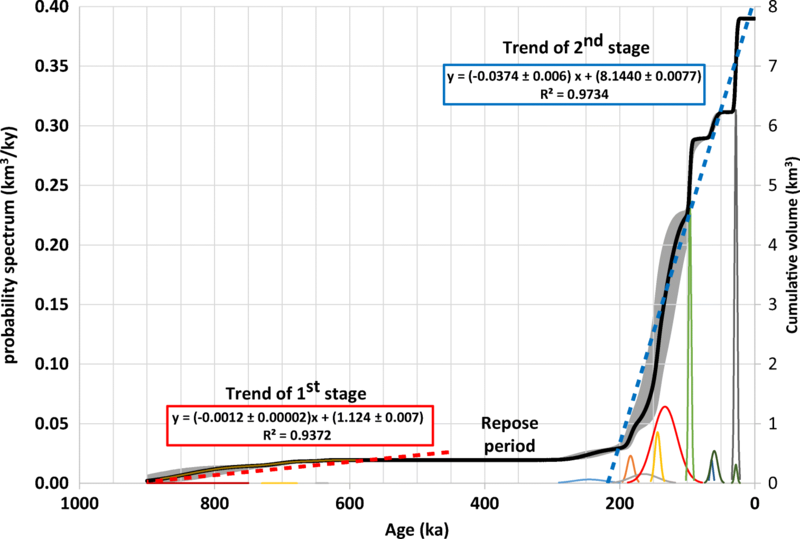 The thirteen new K-Ar ages obtained here do not yield constraints to calculate eruption-scale extrusion rates, but can be used to infer long-term evolutionary trends of Ciomadul in a worldwide context. The overall magma output rate of Ciomadul, considering its ~ 8.00 ± 0.55 km3 original volume and the ~ 850– < 30 ka time period of dome formation, is 9.70 ± 0.51 km3/My (or 0.0097 ± 0.00051 km3/ky). Note that the errors are simply propagated from the overall error estimate presented in Table 1. This value is almost identical to the ~ 9 km3/My suggested by Szakács et al. (2015) who, on this basis, inferred a low-frequency, low-output activity for the system. However, such a rate can be refined, benefitting from the detailed volumetry of individual domes and the new K-Ar ages. We divide the activity of Ciomadul-Puturosu into two stages (Fig. 4) Stage 1 involved formation of the older Puturosu, Balvanyos and Dealul Mare domes. These were emplaced between 850 and 440 ka and are volumetrically much smaller than the domes of stage 2. Stage 2 involved formation of the younger, main lava dome complex over the past ~ 200 ky, and encompasses ~ 95% of the volume. According to the available radiometric ages, the two stages were separated by a ~ 250 ky repose period. Based on Fig. 4 (see also Lahitte et al. this volume), the two stages of subsequent activity suggest two different magma output trends, with a moderate output rate followed by a significantly increased output rate. For the first stage (between ~ 850–440 ka), the rate is 0.0012 ± 0.0001 km3/ky, whereas, after the quiescence, in the second stage (~ 200–30 ka) the rate is 0.0374 ± 0.0019 km3/ky. The ~ 30-fold increase means that most of Ciomadul’s volume, 7.53 ± 0.51 km3 (including the volcaniclastic aprons and the calculated erosion for the central dome area), was emplaced within the ~ 200–30 ka interval. Thus, magma output rate calculation depends on which time interval is considered: the increased rate during ~ 200– < 30 ka is a rate four times higher than the lifetime-averaged long-term output. This finding modifies the conclusion of a generally low output over the lifetime of such a system. For example, White et al. (2006) reported long-term eruption rates for silicic volcanoes ranging from < 10−5 km3/ky to 10−2 km3/yr., the average being 2.3 ± 0.8 × 10−3 km3/yr. for andesites and 4.0 ± 1.4 × 10−3 km3/yr. for rhyolites. In this context, the 0.0012 km3/ky (=1.2 × 10−3 km3/ky) magma output rate for stage 1 is low. However, the 3.74 × 10−2 km3/ky magma output rate stage 2, during which most lava domes were formed, is 10–15 times higher than the worldwide average; even the long-term Ciomadul rate, averaged for the whole life time (9.7 × 10−3 km3/ky), is 2–4 times higher than the worldwide average. As such, the second stage can be considered an exceptionally intense period of activity relative to the general decrease of magma output along the East Carpathians (e.g. Szakács et al. 1993; Karátson and Timár 2005; Szakács et al. 2015). Eruption-scale magma output rates, commonly referred to as lava extrusion rates (i.e. those characterising the real emplacement of individual lava domes; cf. Fink and Anderson 2000), are another issue, which cannot be addressed using the available chronological data of Ciomadul, but require comparison with worldwide analogues. As seen from the aforementioned historical cases, domes with volumes of 0.1 to 0.5 km3 may be emplaced in several months up to tens of years. The DomeHaz database (Ogburn et al. 2015) contains information for roughly 400 lava dome-forming episodes, less than half of which have reported durations (Wolpert et al. 2015). Most of the recorded dome-forming eruptions lasted < 6 years. However, nine lasted > 20 years, and five lasted > 50 years (Wolpert et al. 2015). The longest durations include those of Santiaguíto, Guatemala (97 years since 1922, ongoing, Sangay, Ecuador (187 years, 1729–1916), and Merapi (251 years since 1768, ongoing). Notably, dome extrusion at Santiaguíto has been almost continuous (although variable between 0.2 and 2.1 m3/s (Rose 1987; Harris et al. 2003), but other long-lived eruptions showed frequent pauses up to several years. The reported durations make it possible to obtain a frequency relationship. The near-linearity trend suggests that the durations follow a Pareto distribution (a power-law probability distribution: Wolpert et al. 2015). This finding, with respect to the duration of the longest-lived known eruptions (close to 300 years), implies that dome eruptions lasting for thousands of years (or even longer) are unlikely. The case of Merapi volcano (Indonesia) gives insight into the temporal variation of lava extrusion over hundreds of years (e.g. Siswowidjoyo et al. 1995; Costa et al. 2013; Ogburn et al. 2015). The recent Merapi cone has a several thousand year-long eruptive history (Gertisser et al. 2012) and, in particular, is characterised by a period of dome extrusion since at least 1768, when historical accounts of eruptions became more frequent (Voight et al. 2000). Records and assumptions suggest that all dome-forming episodes within this period were part of a continuous activity, fed by a constant magma supply, with intermittent explosions up to VEI = 4 (Siswowidjoyo et al. 1995; Gertisser et al. 2011). Merapi’s latest dome-forming eruptions in 2006 and 2010 showed observed lava extrusion rates of 2.5 to as high as 35 m3/s (Ratdomopurbo et al. 2013; Pallister et al. 2013). Such high rates can occur occasionally at a number of other lava domes worldwide, including Redoubt, 2009 (> 30 m3/s maximum rate), Mt. St. Helens cryptodome, 1980 (> 40 m3/s maximum rate), Shikotsu, 1909 (> 115 m3/s time average rate), or Rinjani, 1944 (> 120 m3/s time average rate (Newhall and Melson 1983; Swanson and Holcomb 1990; Miller 1994; Fink and Griffiths 1998; Ogburn et al. 2015). Numerically, such high rates during eruptive episodes are clearly smoothed out to long-term averages rates, such as those calculated here for Ciomadul. For instance, a 40 m3/s lava extrusion rate scales up to 1260 km3/ky. This latter figure is 34,000 times higher than the second-stage magma output rate of 0.0374 km3/ky at Ciomadul, and implies long repose periods between the active episodes. The length of the inactive periods would thus have had time scales of tens or hundreds of thousands of years. For Ciomadul, Szakács et al. (2015) preferred a small number of eruptive stages separated by long repose intervals (on the order of 105 years). To quantify the frequency distribution of eruptions within such eruptive stages, again we can take the example of Merapi volcano. Within its ongoing active period, for the time interval 1890–1992, a 100-year average rate of 100,000 m3/month (equalling to 1.2 km3/ky) has been calculated (Siswowidjoyo et al. 1995). This rate is still 32 times higher than that during the second-stage activity at Ciomadul. Therefore, assuming, for instance, a Merapi-type intensity at Ciomadul, during its second stage the average repose period may have lasted ~ 31 times longer than an eruptive period (this period including dome-forming episodes and pauses, as observed at Merapi between 1890 and 1992). The geomorphological evolution of the lava dome complex is summarised in Fig. 5. The volcanism of the Ciomadul-Puturosu group developed on a gently westward-dipping erosional surface consisting mostly of Cretaceous flysch and rarer old (~ 2 Ma) Pilişca andesites. The volcanism possibly occupied episodically the South Ciuc basin palaeolake (Fielitz and Seghedi 2005; Karátson et al. 2013). Following the emplacement of the older, isolated southern domes of Murgul Mare (~ 2 Ma), Murgul Mic (age unknown) and the lava flows of Luget-Malnaş (also ~ 2 Ma), the oldest Ciomadul domes (Dealul Mare, Puturosu and Balvanyos) were emplaced at ~ 850–440 ka (Fig. 5a). Dome volumes remained under 1 km3 in total. After a repose of ca. 250 ky, dome activity resumed in the north of the volcanic edifice (Haramul Mic ~ 200 ka), followed by the Cetăţii dome at ~ 180 ka, the Comloş and Ciomadul Mare central dome complex at ~ 150–130 ka (Fig. 5b), and eventually by the peripheral Haramul Mare dome at ~ 100 ka (Fig. 5c). Karátson et al. (2013) proposed an explosion-crater-forming event (with a crater diameter of 2–2.5 km) that truncated the Ciomadul Mare dome(s). Based on the new K-Ar age of 133 ± 18 ka for the Ciomadul Mare dome (Lahitte et al. this volume), such a large eruption could have occurred shortly after this date. On the other hand, timing of the Mohoş crater formation can now be well-constrained by the newly obtained ages of the rim domes given here and Lahitte et al. (this volume). The Piscul Pietros lava dome (or flow) has a similar age as the Vf. Mohoş dome (60–65 ka, Table 2). Both domes were emplaced morphologically at or around the Mohoş crater rim. Piscul Pietros is cut by the crater rim, implying that the formation of Mohoş crater postdates the dome emplacement at around 65–60 ka. Following the explosive activity of the Mohoş crater, the crater underwent progressive lacustrine infilling. The lacustrine succession comprises several tephra layers, e.g. the TGS and LSPA tephras presented above (Karátson et al. 2016; Wulf et al. 2016), that are interpreted to have originated from St. Ana crater, a new vent formed subsequent to the Mohoş crater (Fig. 5d). This latest eruptive phase of Ciomadul has also been constrained in our study (Table 2) by dating the lava dome breccia that drape the southern crater slopes of St. Ana. The presence of this rock testifies that the final activity was not only explosive, as testified by the LSPA tephra, but also lava dome forming. This is suggested by the new K-Ar age of 27.7 ± 1.4 ka which is in agreement with the oldest 14C age of 27,180 ± 462 cal yr. BP of the St. Ana lacustrine sequence, i.e. the minimum formation age of the crater lake (Karátson et al. 2016), obtained from the deepest cored level (reaching into the pyroclastics deposits wrapping the crater bottom; Magyari et al. 2014). Moreover, within 2σ error, the age is coeval with the youngest 14C age of 29,597 ± 610 cal yr. BP for the uppermost (LSPA) tephra layer in the Mohos crater (Karátson et al. 2016; Wulf et al. 2016). On this basis, we propose the final eruption (LSPA) to be responsible for excavating the present shape of St. Ana crater, which was presumably the site of the exploded, latest lava dome. Notably, the last two explosive eruptions, i.e. TGS and LSPA, are stratigraphically and geochemically distinguishable in the Mohos lacustrine succession (Karátson et al. 2016; Wulf et al. 2016). To highlight that they are chronologically distinct, a simple graphic display presenting their 2σ uncertainty is shown in Fig. 6. For the TGS eruption, we used the well-defined phase-2 pumiceous pyroclastic flow (Karátson et al. 2016), and all published 14C and (U-Th)/He ages (Vinkler et al. 2007; Harangi et al. 2010, 2015; Karátson et al. 2016), while for the last eruption, our individual ages obtained on lava breccia are presented with error bars. The two ages do not overlap even at 2σ level, and show that the last eruption took place at < 30 ka. Careful volumetrical analysis, taking into account the present-day volumes of the lava domes constituting the Ciomadul lava dome complex, their base level and the erosionally removed material, suggests a total volume of ~ 8 km3. By using new K-Ar ages obtained by the Cassignol-Gillot technique, we have determined long-term magma output rates during emplacement of this volume (~ 850 to < 30 ka). Our main finding is that magma output varied significantly during the lifetime of the volcanic complex, with output rates being more than 30 times higher during the second eruptive stage (~ 200 to < 30 ka) than during the first stage (~ 850 to 440 ka). Moreover, our results help clarify the main steps of the volcano-geomorphological evolution of Ciomadul, in particular at the central crater area. In detail, Ciomadul represents a medium-sized lava dome complex. Its total volume of ~ 8.00 ± 0.55 km3 (including erosionally removed material which is only ~ 2%) spreads over an area of 74.5 km2. The first extrusive volcanic stage between ~ 850 to 450 ka, constrained to the SE part, was volumetrically subordinate, whereas, after a ~ 250 ky repose period, the central dome complex was emplaced in the second stage between ~ 200 to < 30 ka representing most of the total volume of the volcanic edifice (~ 7.53 ± 0.51 km3). For the whole lifetime of Ciomadul, a long-term magma output rate of 9.7 km3/My (0.0097 km3/ky) can be calculated. Within this, the first stage was characterised by a low magma output rate of 0.0011 km3/My, whereas the second stage by a significantly increased magma output rate of 0.0374 km3/My. The smallest distinguishable domes at Ciomadul are characterised by volumes in the range of 0.1–0.4 km3, similar to, for example those at Soufrière Hills (Montserrat). These domes could have erupted over several years or decades. Although the chronological resolution of individual eruptions (and related volumes) cannot be assessed, it can be quantified, based on worldwide analogues, that active periods of Ciomadul’s lava dome extrusion, which lasted up to hundreds of years, may have been separated by repose periods lasting ~ 30 times longer. Our findings also constrain the geomorphic evolution of the dome complex which yields an example of millenia-scale evolution of medium-sized extrusive silicic systems. Based on the main findings at Ciomadul, lava dome activity can last for hundreds of ky producing small volumes (≤ 1 km3). Individual domes of 0.1–1.0 km3 in volume can grow separately, however, they can also coalesce to form compound landforms on a 1.0 km3 scale. As the Ciomadul example suggests, reaching a volume up to 10 km3 can occur at a timescale of 100 ky. The domes may display central craters, which can be filled, covered and/or obliterated by subsequent lava dome eruptions. At Ciomadul, the formation of relatively large craters (≤ 2 km in diameter) was due to an increased late-stage explosivity (and no dome infill at the end), although the volume of pyroclastic products that makes up the dome complex is less than one-tenth of the extruded lava rocks. Constructive reviews by Károly Németh and Mike James and editorial handling by Stephen Self and Andrew Harris are appreciated. Open access funding provided by Eötvös Loránd University (ELTE). This work has been supported by the Hungarian Scientific Research Fund NKFIH-OTKA No. K 115472 to DK. Financial support for PL and SD was also provided by the SYSTER 2017 program of INSU, CNRS.